in this beautiful historic building! You really must see this hidden treasure. convenience of a public light-rail stop. Live in Modern Comfort in a Historic Building! 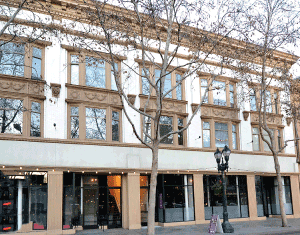 New Century Commons is a fabulous Victorian apartment building in a central Downtown San Jose location, near shopping, Light Rail, and great dining and entertainment. This is a historic landmark, with each apartment modernized for comfort and convenience, while still retaining all the quality and charm of its 19th century heritage. You really must see this hidden treasure. Located across the street from the Light Rail, and half a block to Safeway’s trendy The Market and deli, these apartment homes are in a convenient and happening area! Theaters, museums and fine restaurants are all within walking distance. Indoor cats are welcome with an additional deposit. Some conditions may apply. Discover what’s old and what’s new in this beautiful historic building! With 10-foot ceilings and much of the original woodwork and trim, each New Century Commons apartment home is different and special. Your apartment may have the original built-in china cabinets with glass doors, a large bay window, or large cheerful skylights. Every kitchen is totally modern, with dishwasher and built-in microwave oven.